The Pacific rosewood has a very prestigious reputation. This wood is valued even more highly as it has become rare. The Europeans only traded in this wood biefly because it was so abusively logged that it quickly became rare. 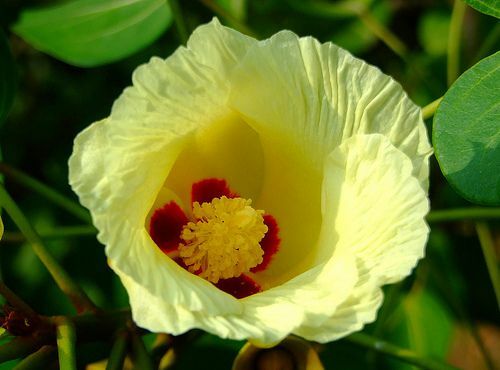 Scientific name: Thespesia populnea – Malvaceae family. Pantropical species. It is only found on the immediate coastline, sometimes planted. A modest-sizedtree with a short trunk, hanging over the shore it has very rough, blackish bark. Its flowers are similar to those of the cotton plant or the bourao but do not open completely. The round fruit, flat at the base and pointed on top, is indehiscent. When ripe, the exterior wall is a woody shell that looks like old leather. It bears fruit from July to September. The seeds float and are dispersed by the sea. By sowing. Dry seeds retain their germinating potential at room temperature. For good germination, the seed must be scarified (on the rounded side). The name rosewood is primarily due to the rose, and spicy, smell released by the fresh sawdust more than the dark pink colour of the fresh wood. The smell dissipates over time. The wood is rather light and soft and is carmine red. It has vertical brown veins. After a few years it turns a magnificent dark brown colour with tawny glints. Its grain is fine, it has a beautiful lustre and is easy to work. It is sought for fine cabnet making, treenware, marquetry and traditional sculpture. Due to its small and twisted trunk, its wood can only be used in small quantities. Furthermore, with age, the heartwood rots and the tree becomes hollow. Another inconvenience: after a certain amount of time, people in the trade may develop allergies of the mucous membranes: sneezing, red eyes, breathing problems and skin irritations. The yellow sap that is excreted by the peduncles is a popular remedy for millipede stings in Tahiti. Children make sprinning tops from the green fruit by pushing the central vein of a coconut leaflet through their centre. Long ago, in the Marquesas Islands sap from the trunk's bark was used to dye the tapas made for newborns. Tahitians macerated the sawdust in coconut oil to make it fragrant. The juice extracted from its roots was a dye used for the same purpose. Rope can be made using the fibrous bark, but it is less strong than rope made from bourao. Rosewood played an important role in traditional Polynesian culture. On some Islands, the cooked and dilacerated bark is given to women and pigs to fatten them up.